Let’s start with the important information you’ll need to get penned into the diary prior to the Christmas absence, in which any thought of business is briefly pushed to the back of the mind in favour of, if you’re lucky, getting some riding in to fend off the likelihood of becoming ‘festively plump’. 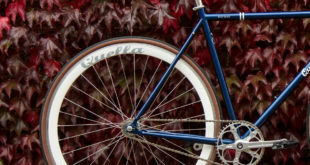 The London Bike Show will once again take place at London’s ExCel Centre, this year running from January 17th to 20th. As if you’d need reminding, one ticket gives you access to three other shows running alongside the cycling exhibition. These are the Outdoors Show, now in its 12th year, the Tullett Prebon Boat Show and the Active Travel Show, introduced last year. Combined, the ExCel centre exhibition drew 85,912 visitors last year, of which 20,000 are estimated to attend primarily for the Bike Show. Anyone who’s been to prior shows will surely have spotted those in boat shoes with bulging pockets ogling the bikes on display – crossover between the exhibitions flows naturally. In three years the event has existed, it has grown from 50 to over 150 exhibitors, spanning 3,000sqm to 14,000sqm of floor space and organisers VOS Media are understandably very excited ahead of this year’s show. For the first time in its history, the four-in-one show has an extra element thanks to a new partnership with the IG London Nocturne race series. The popular race becomes the UK’s first indoor criterium and provides visitors with fast-paced, competitive racing and a fantastic viewing spectacle. Racing will take place each day of the show and the programme includes both an elite men’s and women’s criterium, a number of support races, a youth race; and both folding bike and penny farthing races. Registration for the racing will be open by the time you read this article at thelondonbikeshow.co.uk/attractions/ig-london-nocturne. Trade and media races are even set to take place on Thursday 17th, for those BikeBiz readers who fancy themselves as the fastest in the business. The question on everyone’s lips when a show rolls around is why should I attend? Well for starters, trade tickets are free, so aside from leaving the Saturday lad in charge, it’ll not cost you much to pop along if you pre-register on the show’s website at thelondonbikeshow.co.uk/trade. Secondly, it’s another chance to catch up with the brand managers from the likes of Madison, Eurobike, Brompton, Ultra Sports Europe, Upgrade, Exposure, Fisher Outdoors, Orange, Pinarello, ATB Sales and the ACT, among others. The Factor team has been working on the electronic integration of the new bike with designer Steve Domahidy, and it promises a host of on-board electronics, centred around the firm’s third generation Factor power measurement cranks. The Cycling Stage, which has played a big part in the first two London Bike Show events also returns, but with a new focus on performance. With this in mind the stage has been renamed the Cycling Performance Theatre. Speakers will include coaches and experts who will be looking at how personal performance can be improved through better technique, nutrition and the way cycling is approached, as well as essential maintenance and tuning. That’s not all, the theatre will also host a number of team launches, including that of the hotly anticipated Team Madison Genesis Team and question and answer sessions with some of Britain’s top cyclists. The BikeRadar Training Hub returns too. Run by experts from Koolstof Coaching, the hub offers professional fitness and training advice for a fraction of the price available independently – BikeBiz is told around £115. With sessions lasting around two hours, visitors will have their Vo2 Max tested, receive a spin scan analysis and much more, before receiving a personalised training plan designed to help with achieving goals and taking performance to the next level. Tickets are extremely limited, but some may still be found on the show’s website under the attractions tab, should you or your customers want to learn more. For stand and sponsorship enquiries interested companies should contact Frazer Clifford by email: Frazer@vosmedia.co.uk, or via phone on 07889 362 775.